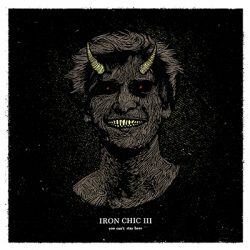 Iron Chic released their new album You Can’t Stay Here on 13th October via Side One Dummy. It’s been a long time coming and a record some thought might never happen. After founding guitarist Rob McAllister died last year, aged 36, many wondered if Iron Chic would carry on and if so what form their next release would take. Four years since their last full length and You Can’t Stay Here is the album you’d expect. At times the lyrics are dark – full of grief, loss and depression – yet there’s an optimism that comes out of it all. There’s the sense that this is what the band have been through and they’ve come out the other end OK. ‘My Best Friend (is a Nihilist)’ is the perfect example of the darkness lavished in an optimism. Swelling rock anthem ‘You Can’t Stay Safe’ is a highlight, while ‘Thunderbolts!’ and ‘Let’s. Get. Dangerous’ are archetypical Iron Chic punk rock. It’s the melodies and raucous guitars that sucker you in with Iron Chic and it’s no different here, while it may be darker in content, if you’re familiar with the band then this is the album you’d expect. Perhaps that is the biggest downfall of You Can’t Stay Here. It’s too safe, there’s nothing surprising or new sounding here. It’s an album we were excited about yet it feels little different to The Constant One. While ‘Planes, Chest Pains and Automobiles’ is a fine track it feels like it could have been lifted from the aforementioned album. Jason Lubrano could always hit a good melody, yet the vocal is a little flat. The lyrics are full of emotion; however, it doesn’t really come across in the vocal. Again, it doesn’t come as much of a surprise as it’s always been a fault. Apart from the superb ‘Profane Geometry’ you can’t help but be a little disappointed with the album.